For other uses, see Arena (disambiguation). An arena is an enclosed area, often circular or oval-shaped, designed to showcase theatre, musical performances, or sporting events. It is composed of a large open space surrounded on most or all sides by tiered seating for spectators, and may be covered by a roof. The key feature of an arena is that the event space is the lowest point, allowing maximum visibility. Arenas are usually designed to accommodate a large number of spectators. The word derives from Latin harena, a particularly fine-grained sand that covered the floor of ancient arenas such as the Colosseum in Rome, Italy, to absorb blood. The term arena is sometimes used as a synonym for a very large venue such as Pasadena's Rose Bowl, but such a facility is typically called a stadium, especially if it does not have a roof. The use of one term over the other has mostly to do with the type of event. Football (be it association, rugby, or gridiron) is typically played in a stadium, while basketball and ice hockey are typically played in an arena, although many of the larger arenas hold more spectators than do the stadiums of smaller colleges or high schools. There are exceptions. The home of the Duke University men's and women's basketball teams would qualify as an arena, but the facility is called Cameron Indoor Stadium. Domed stadiums, which, like arenas, are enclosed but have the larger playing surfaces and seating capacities found in stadiums, are generally not referred to as arenas in North America. There is also the sport of indoor American football (one variant of which is explicitly known as arena football), a variant of the outdoor game that is designed for the usual smaller playing surface of most arenas; variants of other traditionally outdoor sports, including box lacrosse and futsal and indoor soccer, also exist. The term "arena" is also used loosely to refer to any event or type of event which either literally or metaphorically takes place in such a location, often with the specific intent of comparing an idea to a sporting event. Such examples of these would be terms such as "the arena of war" or "the arena of love" or "the political arena". In many fighting games, the stage that opponents are fought in is also called an arena. An arena is often named after a name sponsor. It is common that the name changes with 4–8 years intervals. ^ Claridge, Amanda (1998). Rome: An Oxford Archaeological Guide (First ed.). Oxford, UK: Oxford University Press, 1998. pp. 276–282. ISBN 0-19-288003-9. Look up arena in Wiktionary, the free dictionary. Wikimedia Commons has media related to Indoor arenas. Melbourne Park is a sports venue in the Melbourne Sports and Entertainment Precinct in Melbourne, Victoria, Australia. Since 1988, Australian's bicentenary, Melbourne Park has been home of the Australian Open Grand Slam tennis tournament, which is played annually in January. The park has facilities capable of hosting basketball, netball, music concerts and other events. In the past Melbourne Park has hosted ice skating, cycling, international swimming and motorsport events. The AT&T Center is a multi-purpose indoor arena on the east side of San Antonio, Texas, United States. It is the home of two professional sports teams: the San Antonio Spurs, and the San Antonio Rampage. TD Place Arena, originally the Ottawa Civic Centre, is an indoor arena located in Ottawa, Ontario, Canada, seating 9,500. With temporary seating and standing room it can hold 10,585. Opened in December 1967, it is used primarily for sports, including curling, figure skating, ice hockey and lacrosse. The arena has hosted Canadian and world championships in figure skating and ice hockey, including the first women's world ice hockey championship in 1990. Canadian championships in curling have also been hosted at the arena. It is also used for concerts and conventions such as Ottawa SuperEX. 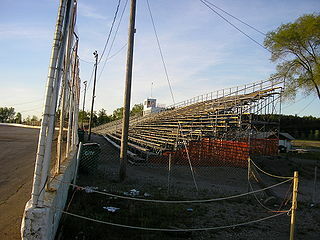 Bleachers, or stands, are raised, tiered rows of benches found at sports fields and other spectator events. Stairways provide access to the horizontal rows of seats, often with every other step gaining access to a row of benches. The Melbourne Sports and Entertainment Precinct is a series of sports stadiums and venues, located in Melbourne, Victoria, in Australia. The precinct is situated around 3 km east of the Melbourne city centre, located in suburbs of Melbourne and Jolimont, near East Melbourne and Richmond. The Kitchener Memorial Auditorium Complex is a multi-use municipally-owned facility in Kitchener, Ontario, Canada. The complex is located on East Avenue, near the Ottawa Street interchange on the Conestoga Parkway. The complex includes "The Kitchener Memorial Audiorium" with the Dom Cardillo Arena, two smaller community arenas the Kinsmen Arena and Kiwanis Arena, the Jack Couch Stadium baseball park, Centennial Stadium and a skatepark outside the stadium. Luxury boxes and club seating constitute the most exclusive class of seating in arenas and stadiums, and generate much higher revenues than regular seating. Club ticketholders often receive exclusive access to an indoor part of the venue through private club entrances, to areas containing special restaurants, bars, merchandise stands, and lounge areas of the venue that are not otherwise available to regular ticketholders. The Pala Alpitour is a multipurpose indoor sports/concert arena that is located in the Santa Rita district of Turin, Italy. It is a few metres east of the Olympic Stadium. The arena has a seating capacity of 12,350 when it is configured for ice hockey, and it is the largest indoor sporting arena in Italy. The arena was originally built at a cost of €87 million euros, for the 2006 Winter Olympics, and long with the Torino Esposizioni, it hosted the ice hockey events. The National Stadium of Thailand is a sports complex located in Pathum Wan District, Bangkok. Founded in 1937 with the construction of Supachalasai Stadium, its main venue, the complex has since expanded and now consists of multiple stadia and sporting facilities. State Netball Hockey Centre (SNHC) is a multipurpose sporting facility located in Melbourne, Australia. It is a home arena of the Melbourne United basketball team of the National Basketball League and the Victorian Vikings hockey team of the Australian Hockey League. The facility is located in Royal Park, Parkville next to the Melbourne Zoo. The arena was opened on 16 March 2001, and is run as a non-profit facility by the State Sport Centres Trust. It is one of four sporting facilities in Melbourne - the others being the Melbourne Sports and Aquatic Centre (MSAC), the MSAC Institute of Training (MIT) and Lakeside Stadium - to be organised under the banner of Melbourne Sports Hub. The Mary Terán de Weiss Stadium, commonly known as Parque Roca due to its location within the limits of the Parque Polideportivo Roca, is a multipurpose stadium in Buenos Aires, Argentina. It is located at Avenida Coronel Roca and Avenida Escalada in the Villa Soldati neighborhood. The Yellow Dragon Sports Centre Stadium is a stadium also used for cultural events such as music concerts and celebrations, located in the center of the city of Hangzhou, Zhejiang province, China. Huanglong means "Yellow Dragon" in Chinese. It is the home of local football club Hangzhou Greentown F.C. The California Vulcans are the intercollegiate sports teams and players that represent California University of Pennsylvania, which is located in California, Pennsylvania. The Vulcans participate in the NCAA Division II in all sports and the Pennsylvania State Athletic Conference (PSAC) in most sports. The school colors are Red and Black. The mascot of California is Blaze the Vulcan. Tauron Arena Kraków is an indoor arena located in Kraków, Poland. It has a seating capacity of 15,030 for sporting events. It hosted the 2014 FIVB Volleyball Men's World Championship tournament, 2016 European League of Legends Championship Finals and 2015 IIHF Ice Hockey World Championship Division I. It also hosted the 2016 European Men's Handball Championship and will co-host the 2023 World Men's Handball Championship with the country and Sweden. CSKA Arena, formerly known as VTB Ice Palace and Legends Arena, is an indoor multi-sport venue that is located in Moscow, Russia. Its main sponsor is VTB. The facility features 3 different indoor arenas, the "Large Arena", the "Small Arena", and a training facility, all housed in the same complex. Both the large and small arenas are multi-purpose venues.